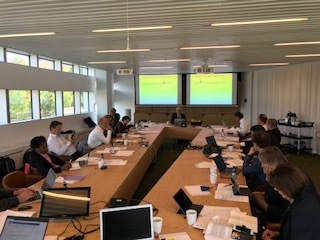 Last week Uppsala hosted deputy vice-chancellors and vice-rectors from the Guild of European Research-Intensive Universities for a Vice-Presidents meeting. These meetings are held a couple of times each year and prepare ‘policy papers’ and similar documents for adoption when the heads of the member universities meet at the network’s General Assembly. On Wednesday evening, Professor Norbert Lossau, Vice-President of the University of Göttingen, led a much-appreciated workshop in the University Main Building on the EU’s Open Science Policy Platform. Storage and accessibility are highly topical issues for research data, as is the issue of open access to research publications. The latter issue is becoming increasingly highly charged. An alliance of European research funding bodies and the European Commission is pushing hard for full Open Access within a few years, but it is still difficult to see exactly what sort of model we will end up with – and how to get there. One of the questions is how to limit the unreasonable profit margins demanded by powerful publishing houses. In Sweden, as in Germany, universities and libraries are currently locked in a struggle with the publishing giant Elsevier, after talks on a new agreement broke down this summer. However, the issue is also complicated by the fact that the vociferous demands for Open Access challenge long-established publishing traditions and norms in different research fields and disciplines. The meeting in the Segerstedt Building on Thursday included presentations and discussions on Horizon Europe, the Guild’s North–South strategy, focusing on Africa, a proposal on a joint Guild summer school for doctoral students, and a proposal on ‘Guild Benchlearning’. The meeting concluded with an update on the European University Networks process in Brussels, in which we in Uppsala are deeply involved through an application with our partners in the U4 Network and the University of Tartu. Guild Benchlearning is a proposal that relates to the type of basic data that all member universities compile in any case for delivery to ranking institutions. The concept of ‘benchlearning’ has been chosen deliberately instead of ‘benchmarking’ to emphasise that we are interested in comparisons for the sake of learning from one another, not for producing our own rankings. These data can provide insight into differences between our universities and areas where we can each improve. They can also be used as a basis for analysis and studies of the Guild network as a whole.